*In November Rihanna went on “20/20” to tell her side her side of the story in the Chris Brown assault (against her) case. Now, Brown has followed suit. Friday night (December 4) he went on the same show to discuss the incident, how he plans to move forward from it and his hopes to win his fans over again. 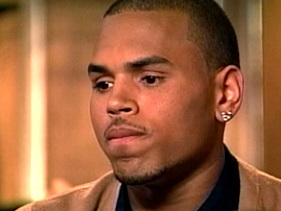 Brown was apologetic throughout the interview as Roberts and he sat and watched multiple clips of Rihanna’s interview last month with Diane Sawyer. When Rihanna described his demeanor during the attack, saying he had “no soul” in his eyes, the singer/dancer hung his head low momentarily before responding. Brown spoke about the criticism he faced in the aftermath of the assault, specifically when Roberts asked about his YouTube apology video. Brown said he was being coached by media professionals who had his best interests in mind, but all the information he received led to him over thinking his words. The result was a message that wasn’t as genuine as he had hoped, he said. During Rihanna’s appearance with Sawyer, she was asked if she heard Brown’s apology song to her, “Changed Man.” Rihanna denied having ever heard the song, which Brown wrote in the wake of the February incident. The song eventually leaked online but isn’t included on Brown’s upcoming Graffiti album. Brown, however, said Rihanna had in fact heard the song. Roberts looked puzzled by the singer’s answer, but he insisted that Rihanna heard the song. He then explained he personally played the song for her shortly after his assault on her, resulting in her being overcome with emotion. “She knows how sorry I am,” Brown said. “She’s heard the song. I played the song for her, the day I [wrote it]. Maybe a month after the situation. Previous ArticleReporter April Ryan snaps at White House press secretary.